At 112,000,000 enrollees, the Medicaid program would outnumber the 2016 Census Bureau regional population estimates for the American West (76,657,000); the Midwest (67,941,429); and the Northeast (56,209,510). Only the South—with a Census Bureau-estimated population of 122,319,574 in 2016—had more people living in it last year than the CBO expects will be enrolled in Medicaid at some point in fiscal 2027. The CBO’s baseline estimates for Medicaid enrollment list two different annual numbers for the program. One is the “average monthly enrollment” and the other is the “total” enrollment. 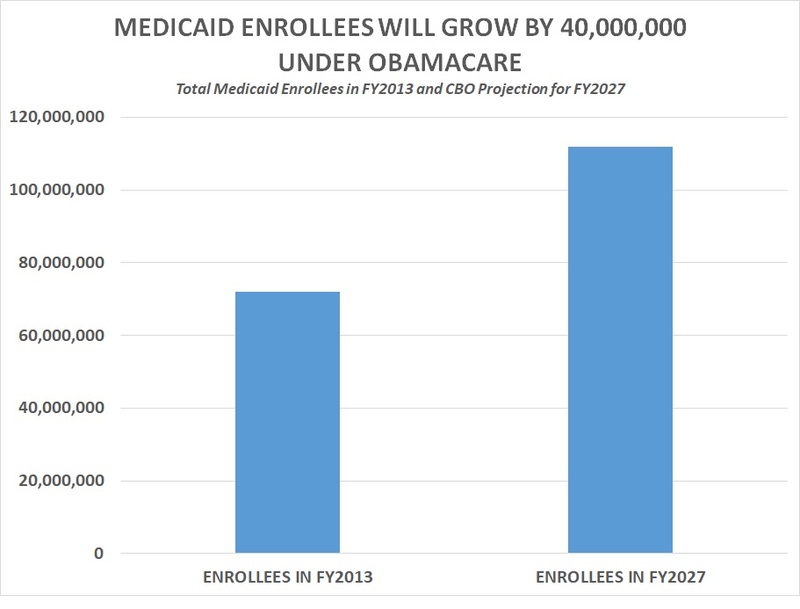 The Medicaid baseline projections that the CBO published in April 2014, shortly after the Obamacare Medicaid expansion started to take effect, said that in fiscal 2013 (which had ended on Sept. 30, 2013), there had been a total of 72 million people enrolled in Medicaid and that the average monthly enrollment had been 58 million. The CBO’s most recent Medicaid baseline projection, published in January 2017, said there was a total of 97 million people enrolled in Medicaid in fiscal 2016 and that the average monthly enrollment for 2016 was 76 million. That means total annual Medicaid enrollment, according to CBO’s numbers, had increased by 25 million from fiscal 2013 to fiscal 2016 (rising from 72 million to 97 million) and that average monthly enrollment had increased by 18 million (rising from 58 million to 76 million). The CBO’s January 2017 baseline projection for Medicaid estimates that by fiscal 2027 average monthly enrollment in Medicaid will climb to 87 million and total enrollment will climb to 112 million. If the CBO projection is correct, that means that from fiscal 2013, the year before Obamacare’s Medicaid expansion took effect, to fiscal 2027, the average monthly enrollment in Medicaid will increase by 29 million (rising from 58 million to 87 million) and total enrollment will increase by 40 million (rising from 72 million to 112 million). “Historically, Medicaid eligibility has generally been limited to certain low-income children, pregnant women, parents of dependent children, the elderly, and individuals with disabilities; however, as of January 1, 2014, states have the option to extend Medicaid coverage to most nonelderly, low-income individuals,” the Congressional Research Service explained in a report on the Obamacare Medicaid expansion. “The Patient Protection and Affordable Care Act (ACA; P.L. 111-148 as amended) established 133% of the federal poverty level (FPL) (effectively 138% of FPL with an income disregard of 5% of FPL) as the new mandatory minimum Medicaid income eligibility level for most nonelderly individuals,” said CRS. “If a state accepts the ACA Medicaid expansion funds, it must abide by the expansion coverage rules,” said CRS.